Happy March to you all! Can you believe Spring is just around the corner? It seems like we have not had much of a winter here in Iowa this year and that is fine by me! The snow is very pretty when it is fresh fallen, but after that it turns into a mess! Little snow has offered me the opportunity to thrift shop more than usual. I don't usually make a special trip, but when I am out on errands it has become a part of my routine to stop and see what treasures they have. My number one rule when thrift shopping is to get rid of some things that are no longer being used at the same time, ya know, so my darling won't keep reminding me about the tendencies of hoarding :) Here are some fun finds that have come home with me recently to use for Spring decorating. These scalloped edge doilies were $1.50 each. They will look great on the coffee table together or separately on end tables. 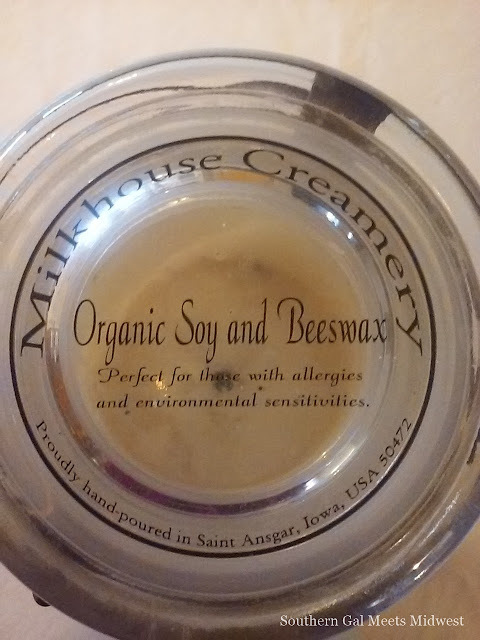 Normally I don't buy candles that have been lit already, but this one is soy and in a farmhouse style jar! No way I could pass it up! 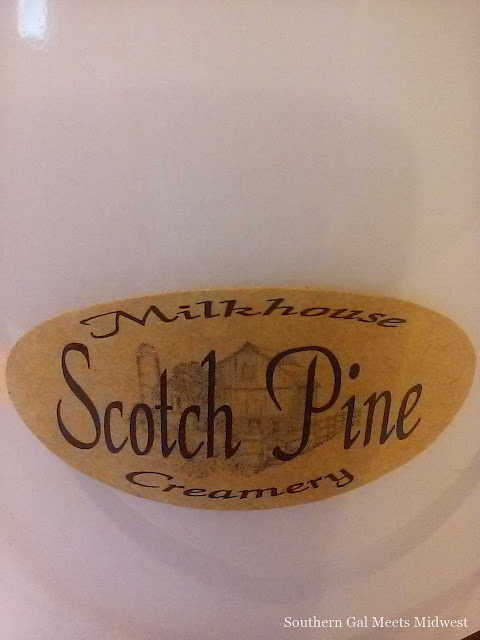 Upon further investigation, I found it is from the Milk house Creamery located right here in Iowa! There are several local retailers who carry these candles and it will be interesting to see how many places I can find that stock them. It is so much fun to stumble across things like this just from a trip to the thrift store! 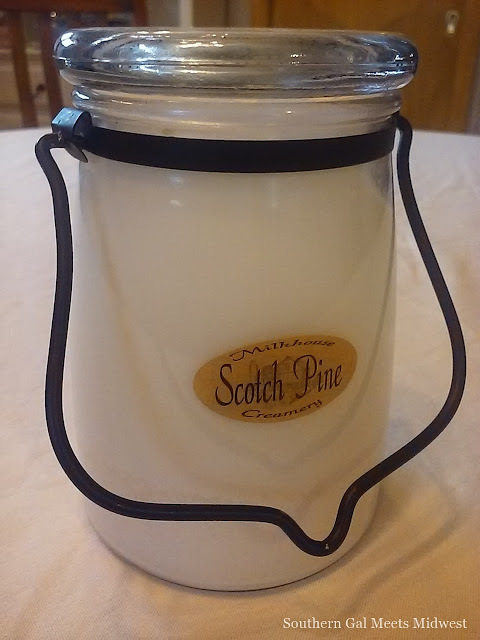 This candle is a wonderful scotch pine scent and I am eager to light it soon. 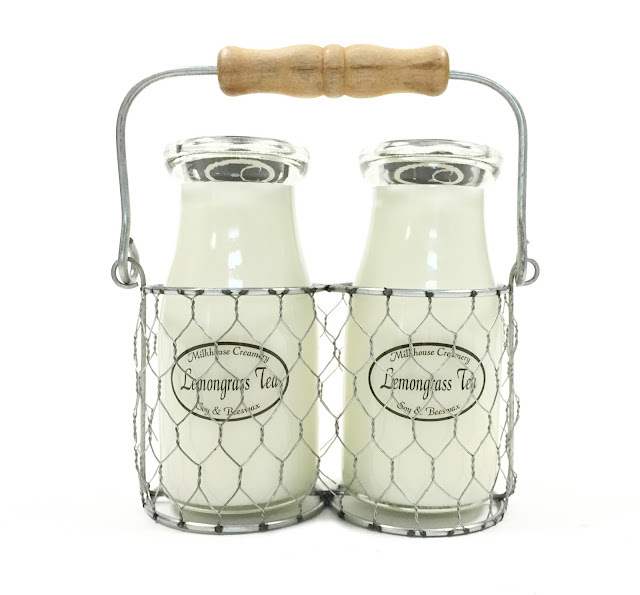 These milk bottle candles in a basket would really add some farmhouse style to any room! 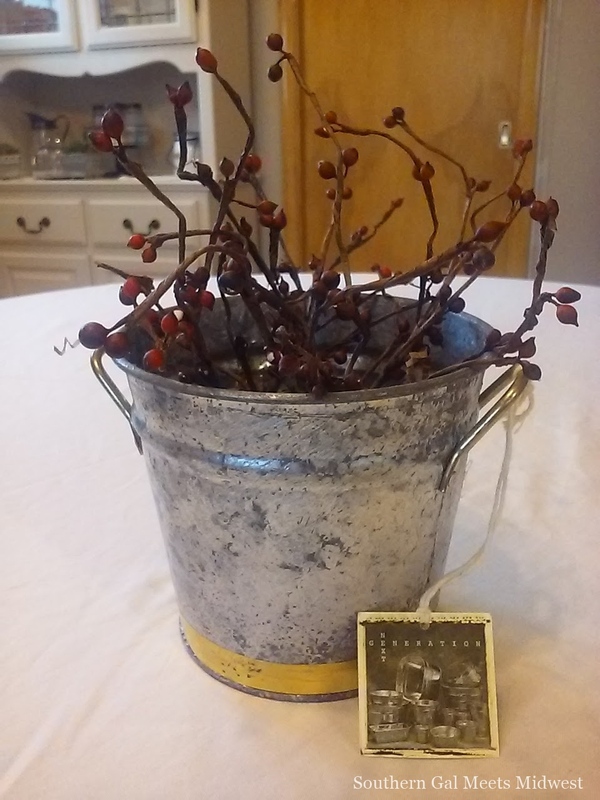 I also picked up this small galvanized bucket, it will be nice with some daisies for Spring. For now though, I added some berries. 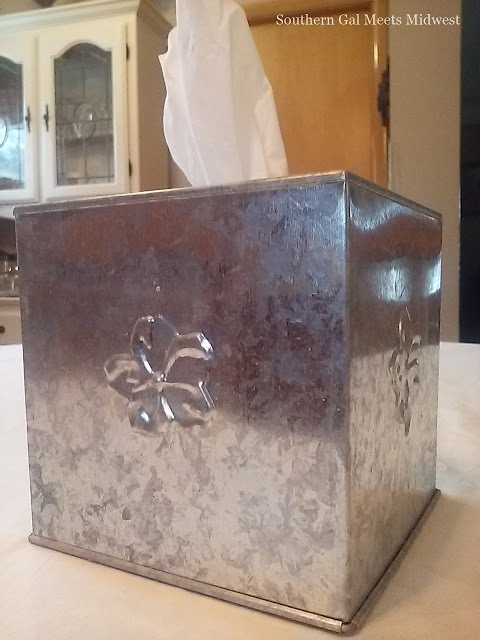 A galvanized tissue box cover. 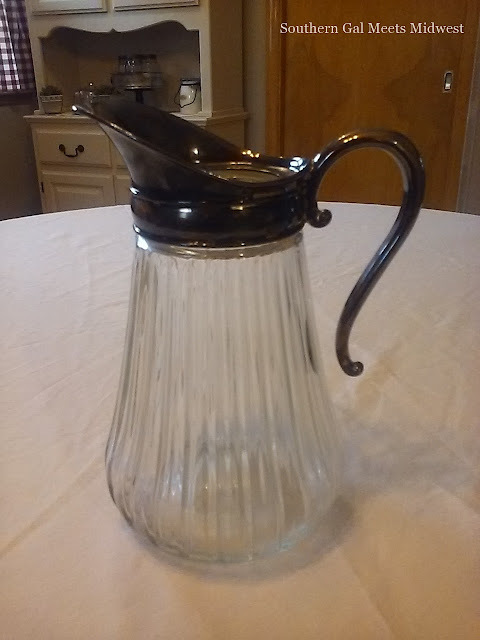 A glass pitcher with a tarnished handle and spout will make a nice vase. 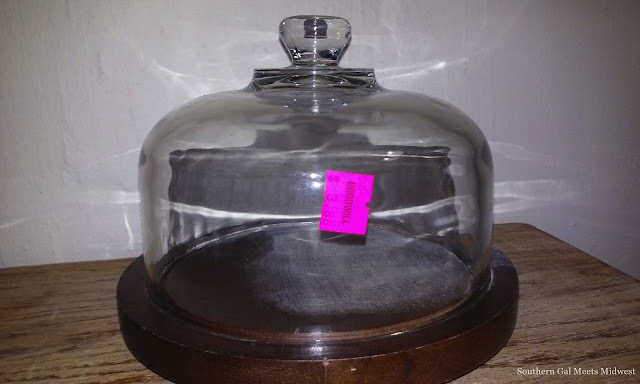 This cloche is perfect except the base was a little too dark. A good sanding and whitewash freshened it up for displaying some Easter decor. 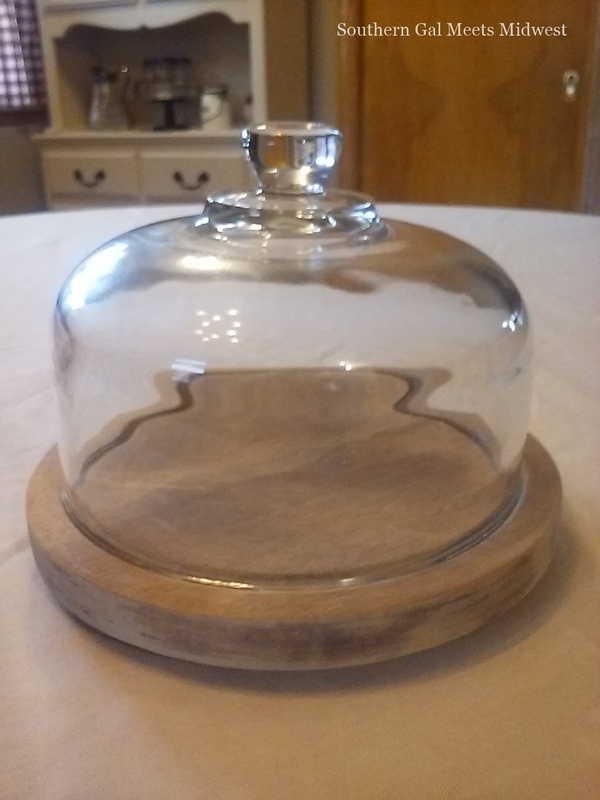 I am planning to use this cloche to display some vintage Easter eggs and greenery. Wow, I love everything you found! That candle is great. I would love to smell the lemongrass one ;) Have a great week! You found some great things, Karen. I think those crocheted pieces were made to cover the arms of chairs (although you could use them for any number of things). Hubby's grandmother used to have them over all her chair arms to keep them from getting soiled. It looks like you found some great items Karen. Aren't thrift stores fun? I don't go to ours unless I'm in the area, you just never know what surprises you may find. Enjoy your week! I am so impressed Karen. You found some amazing things. I think I would pick up exactly what you chose. LOVE the cloche and your DIY. Perfect! Thanks Kim! I don't always have that good of luck when out thrifting but this was a good shopping trip! Hi Karen! I love your finds! Going to thrift stores is so exciting because you never know what you are going to find (Or sometimes, not find, lol). I have followed you so I can keep up with your blog. :) I am a southern girl as well, hubby trying to convince me to move to the midwest. Not on board yet even though I love it there, just can't bring myself to leave family and friends! 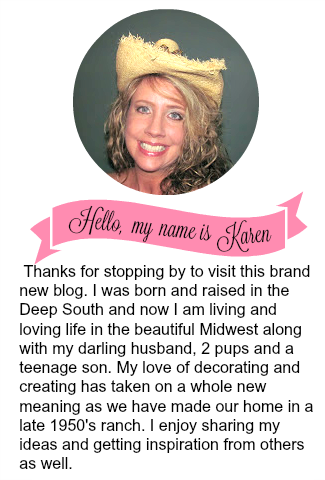 I would love it if you have a moment to check out my blog! Hi Karen, you found some wonderful items on your thrifting stop. Love the doilies and the farmhouse candle was a rare find. Galvanized goodies are always a plus and that pitcher is awesome too. I can see you having fun with the vintage cheese cloche. I have one too and painted the bottom white with distress. It changes often with the seasons. Great cache of wonderful goodies Karen. Love the galvanized look and a good score on the candle. I love cloches, so that is winner. It will look fabulous with Easter decor. Happy Wednesday. Love all your finds. They are great. I have had to stay away from Goodwill cause I was buying to much stuff to use for crafts and never getting them done. I have to be careful of that also Pam :) Thanks for visiting today! Awesome finds! That candle was definitely too cute to pass up! I used to go thrifting almost weekly but hardly ever do now. I still enjoy it but just try to be very selective now. I was bringing home way too much stuff. LOL! Hope you have a great weekend! So nice to meet you! WhT a lovely blog and what gtrat "finds!" I seem to be constantly taking things to our local thrift store but never come out with anything as I really don't need any more stuff.😀 But, I do love Tuesday Morning and TJ Max! I see you live in Iowa, my brother and his family live in Des Moines, I love visiting there! Enjoy your day! Oh my goodness you got some great finds. I love them all. I live so far out it's rare I get to go thrift shopping anymore. Thanks Valerie! I have experienced living far from town too. It is nice to be closer to shopping but at the same time you give up the peace and quiet. Have a great day! Fabulous finds Karen, and that cloche looks beautiful! Isn't it fun to shop at thrift stores and come home with so many unique and hard to find items? Wow! So many great finds! 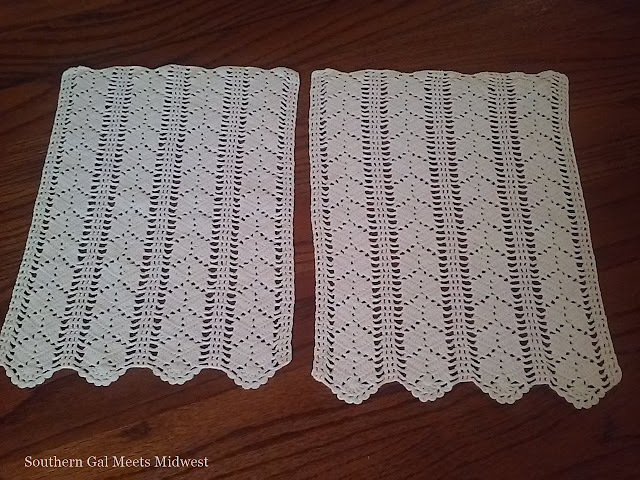 Gosh I have never seen rectangular doilies like that before -- they are beautiful. I think you scored big on this trip -- love all of the vintage candles, tins and that pitcher too.